The central and eastern US has just been in the midst of a major cold wave, with large regions dropping below zero F (-17.7C) and wind chills reaching below -30F (-34C). That is fact. The problem is that the media, some non-governmental organisations, and plenty of individuals are making claims that this event has some kind of implication regarding anthropogenic global warming. On one hand, some global warming sceptics suggest that such cold is clear evidence that global warming is nonsense. On the other, global warming “advocates” explain the cold wave as another example of extreme weather forced by increased greenhouse gases. The truth? Both are wrong. This individual event says nothing about the impacts of global warming. Let me give you a sample of these unsupportable claims. On Monday I was listening to the NPR Program The TakeAway on which Gary Yohe, professor of Economics and Environmental Studies at Wesleyan University, explicitly stated that the cold wave was the work of global warming. And Climate Central was pushing the same scary story. Global warming is sometimes thought of more as “global weirding,” with all manner of complex disruptions occurring over time. This week’s events show that climate change is almost certainly screwing with weather patterns ways that go beyond mere increases in temperature—meaning that you’d be smart to hold onto those winter coats for a while longer. And then on the other side, FOX News suggested that the cold wave indicated global cooling. I could give you a dozen more samples on both sides of this issue. All wrong. One thing we do know is that the proximate cause of the current cold wave is a substantial undulation of the jet stream, with a deep trough over the central US (see map below). Ridges are associated with sinking motion and warming, while troughs are regions of low-level cooling with movement of cold air from the north on their western side. You will notice that the western US has a ridge, with above normal temperatures and a lack of storminess and snow! Would we expect global warming to produce such a pattern? More on that later. Let’s examine the claims of both sides of this extreme argument. At first glance, you would not give much credence to this suggestion. If temperatures were warming due to mankind’s enhancement of greenhouse gases you would expect fewer cold waves. 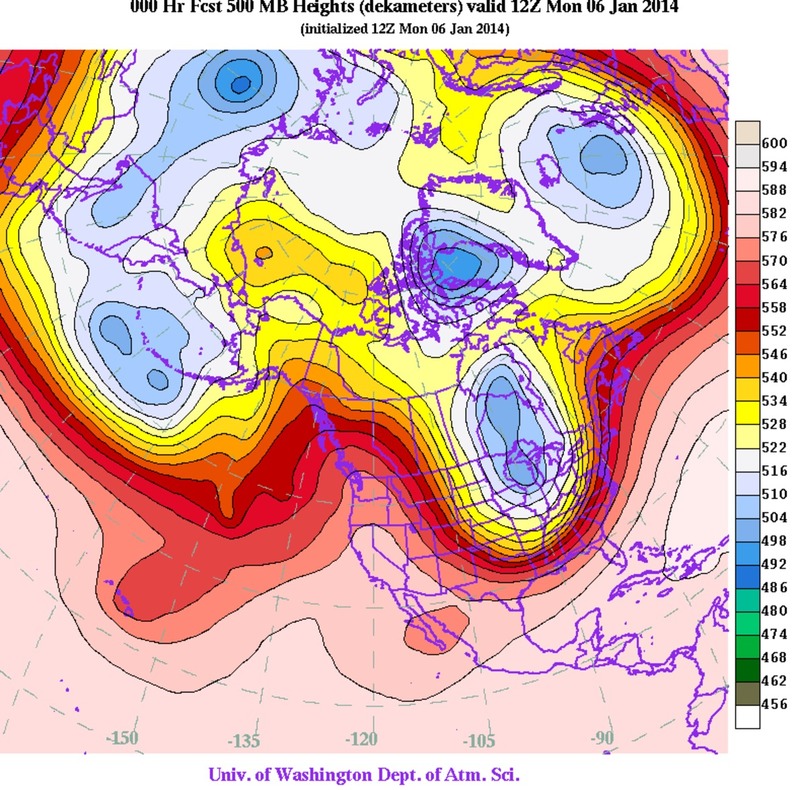 But a few researchers came up with a hypothesis that as the poles warm the jet stream would weaken and that would result in more waviness of the jet stream. However, recent work by Professor Elizabeth Barnes of Colorado State has shown that there were methodological deficiencies in the research suggesting increased jet undulations with global warming. And that there is no observational evidence of increased waviness. Furthermore, there is little evidence that the jet approaching North America has weakened recently. The National Climatic Data Center has a page where you can plot the percentage of the country with an extreme low minimum temperatures (see blue bars in the figure below). The percentages are declining, which does not suggest cold waves are getting more extensive. The bottom line: the claims that greenhouse warming causes more cold waves like we have seen this week really seems to be without any basis in observational evidence or in theory. The media needs to stop pushing this unsupported argument. This claim is really without any basis. Global warming will occur over the the coming century and only can be determined statistically since there is a lot of natural variability in the climate/weather system. One event proves nothing. Furthermore, the real warming is in the future. As shown above, the undulations of the jet stream cause regional changes in temperature and thus there are both warm and cool areas. So if you want to say that global warming is causing the cold and snow in the east, you would also have to say it is causing the warmth and poor-snow conditions in the West. So by their logic, Californians would say “global warming” is real, while easterners would claim the opposite. It gets kind of silly. It is so frustrating that every major weather event causes such claims and counterclaims to be aired, with many media outlets unable to do the minimal research that would allow them to give the public more dependable information. 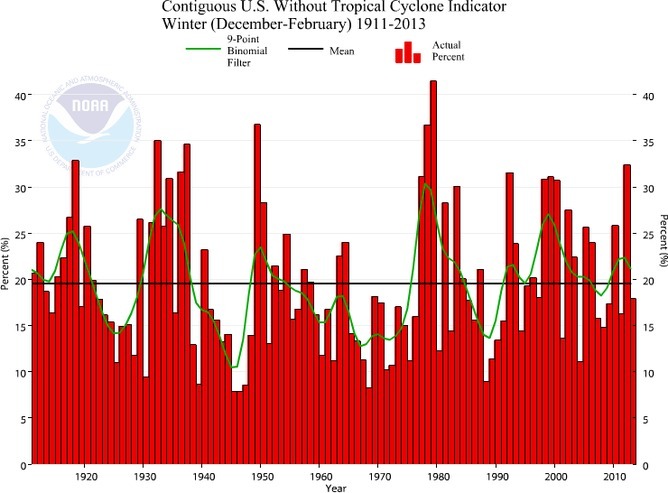 All this bogus reporting has done substantial damage, with many Americans believing that global warming is already causing our winter weather to become more extreme, while the observational evidence suggests no such thing. One day some sociologists will study this situation and the psychological elements that drove it. 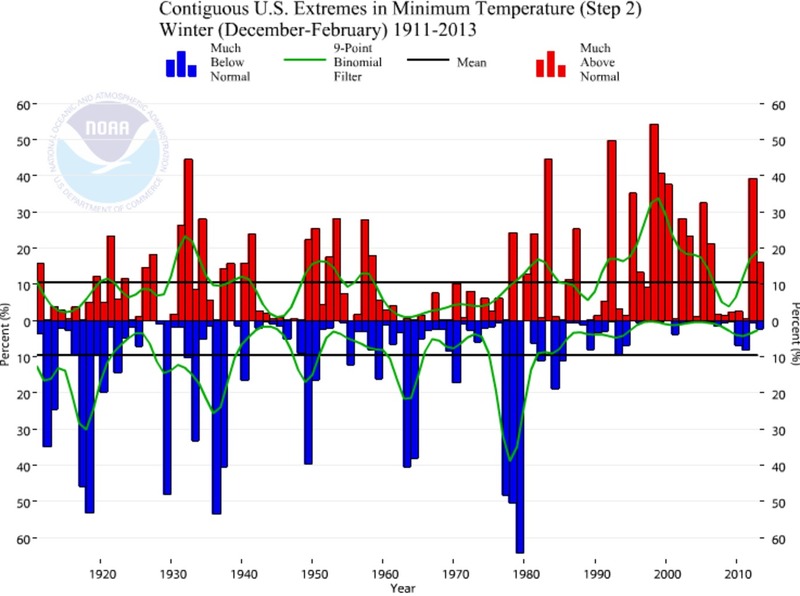 Just to illustrate that extremes are not increasing in the US, NOAA maintains a Climate Extreme Index (CEI) that includes many parameters. Here is a plot of that index for winter for the last century for North America. No trend. Cliff Mass is professor for Atmospheric Sciences at University of Washington. This article was originally published at the Cliff Mass Weather Blog. This post was sourced here.